There are many ways to predict what could be a smash hit each season, but for all the runway shows, lookbooks, street style images, and viral Instagram trends that present themselves, one thing is always certain: The people paid to decide upfront what will sit on a shop-floor or e-commerce site know best. These are the talented buyers so attuned to understanding what you want before you even know you want it, and for that reason, we think it’s imperative to check in with our It item–hunting friends making those major decisions behind the scenes. What they fell in love with (or made sensible, analytics-based choices on) way back in February when designers offered up their fall 2018 collections are now coming into play. So which trends and key items did they put their business behind? What has already captured the interest of keen shoppers? 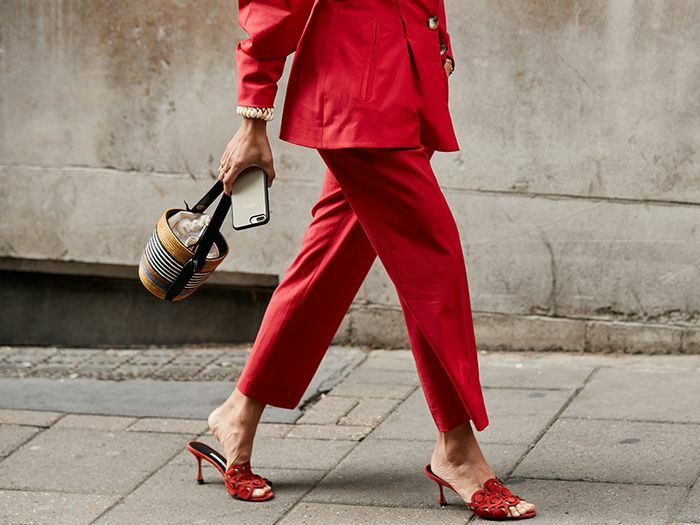 We found out by tapping the top brains in the business at Net-a-Porter, BrownsFashion.com, Gang of Earlybirds, Couverture & The Garbstore, and Harvey Nichols to bring you the inside track. iPhone notes at the ready because we’re about to get so far ahead of fall that you’ll feel like harvest festival has been and gone. Both Brownsfashion.com and Gang of Earlybirds agree: Staud’s Shirley tote is going nowhere fast. This has been a popular buy for many retailers and now comes in a selection of new colorways. “It’s all about vintage shapes, and this dress by Les Reveries ticks all the right boxes. It’s so versatile; you can wear it in either a pretty way with sandals or with a hoodie and chunky ankle boots to make it feel grungy. It launched just two weeks ago, and it’s already sold out in most sizes,” says Net-a-Porter Fashion Director Lisa Aiken. “Our customers are losing their minds over the Prada Flame sandals; both colors are nearly sold out via waiting lists. Not only is the style hot, neon was also a huge trend for F/W 18,” says Hollie Harding, BrownsFashion.com’s footwear buyer. These beauties will be landing at the end of this week, so stay tuned. Celenie Seidel, market editor at Farfetch, has a strong feeling about this knit being a runaway success. “The Calvin Klein 205W39NYC x Warner Bros. collaboration saw beloved Looney Toons characters reimagined in knitted form: These sweaters feel like future collector’s items and are joyfully nostalgic,” she says. “One of our fastest sellers of last winter, the Hide Jacket will still be a successful item this year. The puffy jacket trend is still on trend, and the vegan leather developed by the brand is the best alternative to leather I have ever seen,” explains Gang of Earlybirds founder Fanny Airault. “We are all about the socks, and these metallic-coated silk socks from Maria La Rosa have been flying off the shelves,” says Couverture & The Garbstore buyer Akiko Takamura. “The leopard-print pieces from Rixo London proved hugely popular with our customers, and the whole collection sold out within a couple of weeks. The next delivery, in black, is due to land in-store in the next few weeks,” says Harvey Nichols head of womenswear buying Hazel Catterall. You can shop more of Harvey Nichols’s Rixo buy here. “This item has all the features of a big hit: It’s an accessory, it’s fun, the pricing is excellent, it’s distinctive, it’s an influencer’s favorite and everywhere on Instagram. We are one of the first retailers in Europe to carry it and the first in France, and we’re expecting a restock in mid-October,” says Airault. “The trend for the latest designer sneaker continues, and as with any highly anticipated launch, Chloé’s Sonnie sneaker is in hot demand. We’re already running a waiting list for the next delivery,” says Harvey Nichols’s Tina Lamb. “It’s pretty hard not to obsess over something that’s Gucci and Bambi and baby pink, no? Perhaps predictably, our customers were obsessed with these sweatshirts, which sold out the day they were delivered,” says Octavia Bradford, BrownsFashion.com’s womenswear buyer. “I predict we’re going to see a lot of this sandal during fashion month. We’ve already had such a great reaction to them, they’ve sold out in nearly all colorways and sizes, and we’ve reordered more for the new season. Add them to your Wish List now to avoid disappointment, as they’re currently one of our best-selling styles in our shoe category,” says Aiken. “Another one to watch, Trademark is one of our new hero contemporary bag brands, and I’m really into their wristlet style. They’re minimal, elegant, and timeless. Priced at $385, they’re the perfect combination of compelling price point meets interesting design,” says Aiken. These will be coming to Net-a-Porter very soon—sign up on the brand’s main page for updates. BrownsFashion.com’s team report to us that this Off-White industrial belt sold out yet again when it recently restocked—the unusual accessory continues to be popular, and so does the brand, with many retailers divulging that they’re still seeing a huge demand for anything Virgil Abloh’s Off-White creates. Danse Lente’s Phoebe bag continues to be a big seller for BrownsFashion.com and is now arriving in more autumnal shades like the above. “We have sold over a 1000 units of the Tohum Puka Shell necklace, and our reorder has just been delivered, and that is selling fast too,” says the team at BrownsFashion.com. “The next step on from trainer mania comes via Gucci’s Flashtrek trekking boots. A footwear trend that can legitimately withstand winter in the northern hemisphere—refreshing!" says Seidel of the new trainer-boot hybrid from Gucci that everyone’s talking about. This post originally appeared on Who What Wear UK. Next up: the autumn outfit ideas worth copying.